One of the town floats being paraded through the center of Osaka. 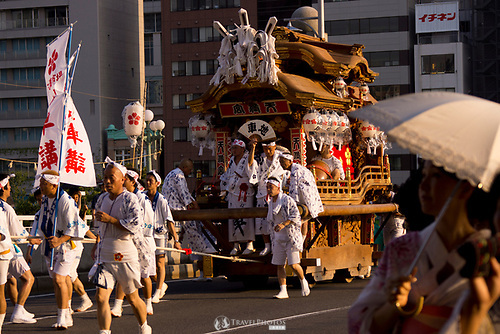 This Travel Info blog post is about the Tenjin Festival (Tenjin Matsuri; JNTO). The festival began over a thousand years ago, and it seems the actual start date has been lost in time. However, the Tenmangu Shrine that hosts the event is known to have been founded in 949AD (Wikipedia). Today, the event is held on the 24th and 25th of July each year according to the Gregorian calendar. It is assumed that the timing of this event once followed the Lunar Calendar, as most Far East events were once pegged to. 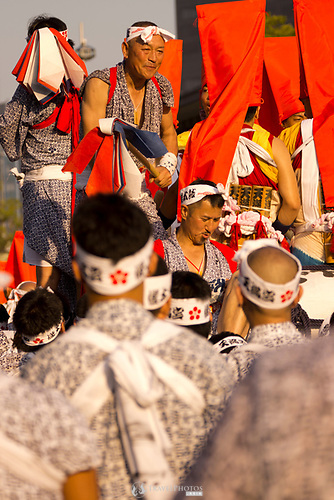 Some regard this as one of the top three festivals in Japan; I guess if judged by visitor numbers alone. 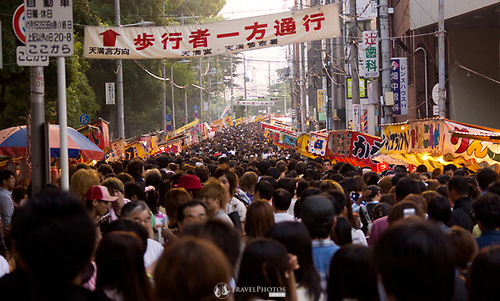 I have been to “small” and “local” events like the Tado Horse Festival and the Naked Man Festival, which attracts about 100,000 to 120,000 people; just looking at one street loaded with people, it appeared that there were many, many more than 100,000 people (perhaps double), and that was just one of the many streets that were closed to traffic. Then at night time the street closures and police crowd control becomes a major event to itself. Unfortunately, and unusually, there is no Wikipedia page on the event and so finding crowd figures is difficult. However, my guestimate would be that perhaps close to a million of the 19 million Osakan inhabitants would be attending, including families with babies in prams, teenagers hanging out with their friends, elderly also hanging out with their friends. It’s a real chance to get out and relax before the summer really begins. 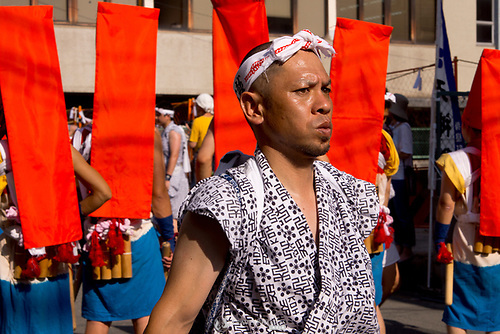 Men in the Tenjin Festival (Tenjin Matsuri) in Osaka. 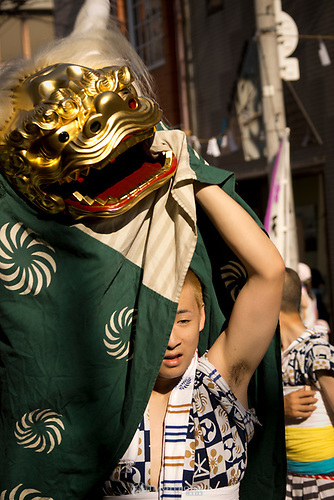 The parade through town event starts at about 3.30pm and winds up back at the Tenmangu Shrine at 6pm. Many of the parade participants and others continue on barges and boats from 6pm to 10pm. There’s not many people out to see the actual parade, but most come out in the evening afterwards. In the area there are food and toy stalls selling the regular festival food like bar-be-qued corn on the cob, grilled meats including beef, pork, squid, and lots more. Since it is summer, and most people have spent the day in air conditioning, you’ll hear the wailing of ambulances probably whisking away heatstroke victims. These photos, and more like them, are available in high resolution for licencing. 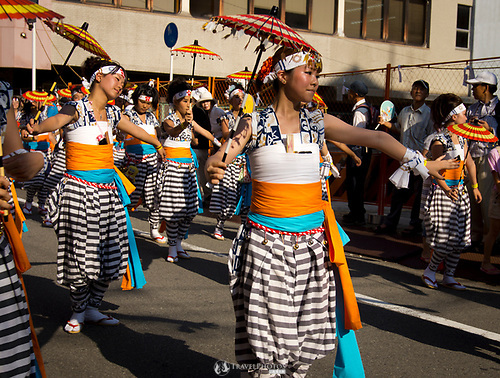 Also, the Tenjin Festival video is live on my YouTube Channel. 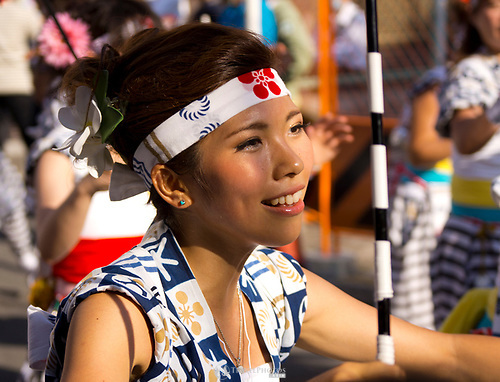 For more on summer festivals in Japan, click on the tags for this post. Also note, that the Japanese word for festival is “matsuri” or まつり. This blog post was updated on the 1st June 2018. Originally, this blog story was a “Photo of the Week” post, but then modified to be a “Travel Info” story. I’ve finally had the chance to play with photo borders a little, and here are two of the results. It’s that time of year, when people go on holidays and holiday destinations get… popular. Here is my all time favourite city, Kyoto. In particular this Photo of the Week is of the Torii Gates at Fushimi Inari, from the Temples and Shrines collection. According to Wikipedia, Fushimi Inari was founded in 711 (ironic, Japan loves 7-11) to worship Inari, the god of businesses, merchants, and manufacturers. It is an amazing place to walk through. You can spend an entire morning strolling around the hills where these make paths enjoying a surreal-like adventure land. However, this time of year… and considering it’s Kyoto, take a thermos filled with your favourite cold drink from a vending machine, and a fan; you will sweat.